LANSING — During the summer of 2014, drivers on M-59 in Oakland County’s 44th House District couldn’t miss the blue campaign sign hanging above their vehicles, Rep. Jim Runestad (R-White Lake) says. At the time, Runestad was running for his first term in the Michigan House. His top primary opponent was Liz Fessler Smith, the daughter of a former state senator. 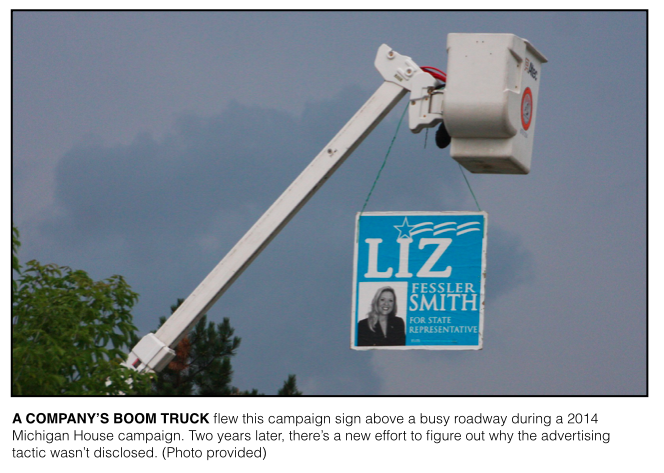 Before the election, according to Runestad, Smith benefited from a boom truck holding a Smith campaign sign in the sky above M-59, one of the busiest stretches of roadway in the district. But the boom truck, which was operating like a billboard, never showed up as a contribution to Smith’s campaign or as an independent expenditure in campaign finance disclosures, according to Runestad supporters. Even today, two years later, there’s been no public disclosure of the truck’s use in the campaign — other than multiple formal complaints filed with the Michigan Secretary of State. According to Runestad and others, a new complaint filed with the state late in 2016 about the situation could test state regulations on the disclosure of corporate influence in elections. Runestad is concerned about the use of property that’s taxed as business property in campaigns. He also questions if this situation were allowed, whether Walmart would be able to hand out bags with candidate logos on them. In 2015, the Michigan Secretary of State’s Office rejected a complaint that alleged the boom truck was an undisclosed in-kind contribution directly to Smith’s campaign. The office said the truck’s use was actually an independent expenditure — meaning it wasn’t controlled by the campaign itself. Now, at the end of 2016, a new complaint filed with the Secretary of State’s Office alleges that the use of the truck was never disclosed as an independent expenditure either. The complaint comes an entire election cycle after the sign was flown. It also comes at a time when corporate spending in elections nationally is increasing and when corporations in Michigan are allowed to spend unlimited amounts as long as they do it independently of candidates. In 2015, Paul Kane, of White Lake, was the first person to file a complaint with the state about the use of the boom truck in Oakland County. 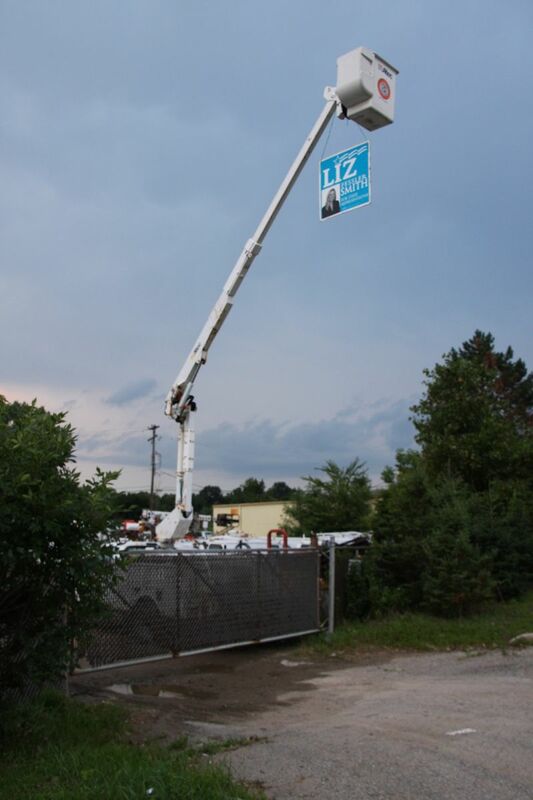 Kane alleged that AMcomm Telecommunications made an unlawful in-kind contribution to Smith’s campaign by having one of its boom trucks hold a campaign sign that said “Liz Fessler Smith for State Representative” above M-59 from AMcomm property. If the use of the truck was an independent expenditure, Kane alleged that Smith’s campaign had improperly coordinated with AMcomm on the use of the truck because Smith’s husband, Mike Smith, also happened to be a manager at AMcomm, according to Kane’s complaint. According to filings with the state, Mike Smith denied having any discussions with Matthew Schultz, president and owner of AMcomm Telecommunications, about the use of the boom truck. The Secretary of State’s Office said the use of the truck was an independent expenditure and said Kane had no real evidence of improper coordination. Thus, his complaint was denied. In Michigan, for an independent expenditure to have been illegally coordinated with a candidate’s campaign, the campaign has to have controlled the expenditure. Runestad said a person would “almost have to tape record the conversation in a board room” to prove coordination occurred in Michigan. Now, at the end of 2016, a new complaint has been filed by Kathleen Chesnut, of Highland. She says if the truck’s use was an independent expenditure, it was never disclosed as one to the Oakland County clerk. Under Michigan law, an independent expenditure controlled by a person would have to be disclosed to the clerk in the county of the person making the independent expenditure. In an interview this week, Schultz said he hadn’t heard from the Secretary of State about the new complaint but that Smith’s husband had worked at his company for 18 years. Schultz said he left a dinner for Smith’s 2014 campaign with a sign and decided to hang it with the truck. Schultz said he had done similar activities in past millage elections and he said he knew that because of zoning laws he couldn’t leave the signing hanging for long. He alleges the sign hung for about a day and a half. Fred Woodhams, a spokesperson for the Michigan Secretary of State’s Office, said the office had received Chesnut’s complaint and is currently reviewing it. Runestad said the state’s handling of the complaint will say a lot about the enforcement of reporting requirements and the penalties for not reporting. Runestad maintains that the truck should at least have been reported as an expenditure.